Save money in your project by avoiding miscommunication, overruns, and problems before any code is produced. Free Templates to download and use to help build your plan. 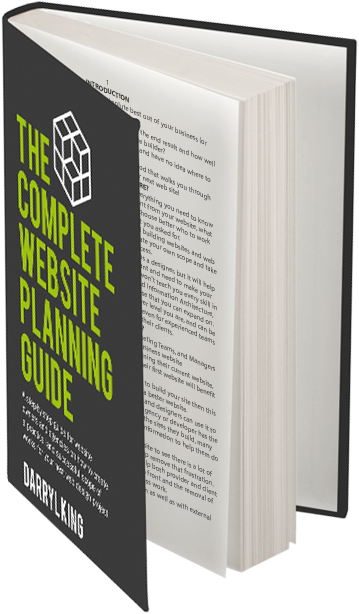 A simple website planning method that walks you through planning, designing and building your next web site. It won’t teach you how to build websites as a designer, but it will help you get the right designer to build the site you want. Get a free sample. Join our list and receive the first three chapters free complete with the cover artwork, table of contents and sample pages. Building a website can be extremely challenging when you know nothing about web development or code. This book outlines and breaks it all down for you - step-by-step on how to plan, recruit and execute your next website launch. Darryl has written the book in easy to follow language coupled with great checklists and templates that you can print out.